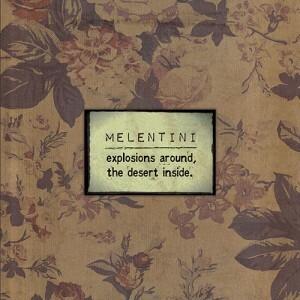 [tab] [tab_item title=»Bio»] Melentini is a musician(trumpet/piano/singer) and song writer , founder of the the Running Blue Orchestra (cello / Electric guitar, bassoon , bass , drums) and also the lead singer and main songwriter in the electronic group Sequence Theory Project. She has also composed a series of music pieces for short films, theatrical plays and has also appeared in theatrical roles as an actress for several years. She has worked in Education as a music teacher in primary schools, junior high and as a piano/keyboard instructor in the conservatoire. Her latest album – «Explosions around, the desert inside»- is a solo work with the participation of exceptional musicians performing in her own orchestration which includes symphonic strings, theremin , brass and was released by Restless Wind in February 2013. She has also an unreleased project with the electronic musician Pan Pan which is a remix of 4 tracks of her solo album in a minimal ambient/beat/electronic style. Melentini’s solo work has been influenced by a variety of musical styles and genres, including jazz, avant-garde, ambient, electronic, with references to vintage pop, dark cabaret, Icelandic post rock, Irish folk songs and Balkan lullabies. Her main characteristic is the minimal structure. Melentini was hosted as a speaker in Tedx University Of Macedonia performing live at the Byzantinum Museum. She was also hosted in the National television of Hellenic broadcasting corporation to perform live with her band in a cultural show. Her song “gone are the days” was selected by the Guardian uk in a list with the 40 best songs around the world in March 2013. Her album “Explosions around, the desert inside” was included within the best 10 albums of the alternative Greek scene in the year 2013 by the main urban magazines, music critics and journalists in Greece. cover for the X-Mas collection.